Partnership will see "deep technology expertise" from Dell portfolio extended to all McLaren work, including Formula 1. Dell has revealed a new partnership with motorsport legends McLaren that could signal a smarter future for the latter's high-powered vehicles. The computing giant says that it will bring "deep technology expertise" to all of the McLaren Group companies and brands, including its Formula 1 team and McLaren Applied Technologies, which works across Formula E, NASCAR and IndyCar racing. 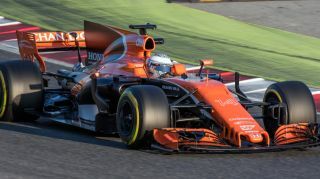 “McLaren’s agreement with Dell Technologies expands beyond the traditional sponsorship model," said Zak Brown, executive director, McLaren Technology Group. "We are like-minded organisations led by the key principles of technical innovation and human progress at the cutting-edge of data-driven technology. Formula 1 is a relentless environment, and partnering with Dell Technologies provides us with class-leading capabilities and support to drive invaluable efficiencies that will enable McLaren to perform at the highest possible level across our entire business operations. " McLaren says it has been undergoing an IT transformation for some time, the company says, and recently completed the first part of this by introducing a range of advanced data centre services utilising Dell EMC hardware. The two companies will now look to collaborate on a range of technology-related projects, including work on security, cloud and workplace transformation efforts. “Dell Technologies’ relationship with McLaren builds upon a shared heritage of innovation, engineering excellence and high performance," added Jeremy Burton, chief marketing officer, Dell Technologies. Over the past few years, McLaren’s rich history in motorsports has given rise to a more diverse and ambitious organisation that we’re excited to partner with." “Our partnership is expansive, enabling us to showcase our Dell Technologies portfolio from consumer gaming and esports to the enterprise edge, data centre and cloud."